This a licensed people to people tour for US citizens. It is perfect for those interested in learning about Cuban Art, visiting the Artists' studios and buying art direct which can be legally exported to the United States. This tour is also available for British and other nationalities who dont need a license to visit Cuba. Orientation drive of city from airport –Revolution Square (short stop) and change money en route at a Cuban bank. Upon arrival - welcome Mojito cocktail at the Hall of Fame bar in the Hotel Nacional in Vedado, an iconic hotel constructed in 1930, modelled on the Breakers hotel in Florida. A traditional Cuban Creole lunch in the ranch style restaurant in the hotel garden. 7:00 pm Cocktail Reception on the roof of either the Hotel Parque central or the Hotel Saratoga, both 5 star hotels in old Havana. Meet some of cuba's artists here. 8:00 pm Dinner at local paladar, Café Laurent in Vedado. We visit the studio and gallery of famous artist, Nelson Dominguez, in old Havana. 1:00 pm Lunch at La Mina in the courtyard near the Plaza de Armas. Return to hotel for rest and at 4.00 pm we depart for a Cocktail Reception at Ludwig Foundation, an Arts foundation located in a beautiful penthouse in Vedado where we will meet young aspiring Cuban artists including Frank Mujica and Ariamna Contino. Dinner at San Cristobal paladar in old Havana, great food in an amazing museum like atmosphere. Cocktail late afternoon at the residence of artist, Kadir Lopez, in his lovely house in Kohly. Kadir collects old petrol station signs and superimposes a special photographic image. Americans love these images because they remind them of the USA in the 1950s. 7:30 pm Dinner – L’Atelier paladar, an amazing Mallorcan style farmhouse in the middle of Vedado. Afternoon of Mid-Century Architecture with an architectural historian – driving tour including visits to the iconic 1950’s Riviera Hotel and the Havana Libre Hotel known as the Hilton before the Revolution. Depart Havana to visit Las Terrazas in the Sierra del Rosario mountains . Visit the community of local artists. 7:00 pm Dinner at Club Havana beach club. We can make arrangements for an add-on to your trip. This could be 3 nights in the colonial gem town of Trinidad which celebrates its 500th anniversary in 2014. A mini bus and guide would be provided for this extension and you would also get the chance to stop for a city tour of the beautiful city of Cienfuegos en route. 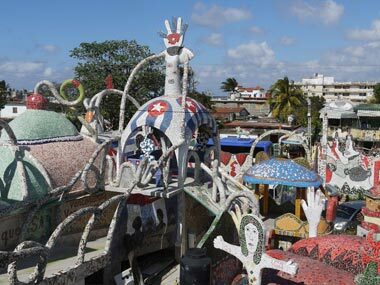 There are several artists to visit in this area and a print makers' cooperative in Cienfuegos.